Desktop TL is a small transmission line compact box that employs a ScanSpeak wide band driver, the 5F/8422T01. This box has been developed by Bernd Timmermanns. The transmission line is built up from little wooden boards sawed at right angles, without diagonal cuts. The crossover sits outside on the rear of the enclosure, and for this reason we do not provide terminals. The crossover consists of two LRC notch filters wired in series. They equalize the baffle step and a membrane resonance at 7.5 kHz. 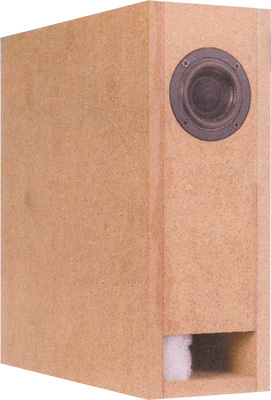 Between 70 Hz and 20 kHz, the frequency response of this loudspeaker is suitably flat at a 30 degrees sideways angle. A drop occurs at 470 Hz, the transmission line's resonance frequency, but this should not disturb. For a wide band driver, the decay spectrum is excellent. At low volume, i.e. 80 dB at 1 m, nonlinear distortion is extremely small. "In practice the Desktop TL shows off the typical abilities of a transmission line speaker such as a wonderfully clear bass with fine resolution and astonishing extension. Fat beats as in Marla Glen's "The cost of freedom" come through authentically and provide for real fun, as does an audiophile double-bass like in the Yuri Honing Trio's "Walking on the moon". Voices sound clear and natural with splendid resolution of their fine overtones. "Grandma's Hands" by Livingston Tylor reveals a diversity of vocals which only very good loudspeakers can render so effortlessly. At the top, a potent and colourful treble is radiating, not at all overdone, but with finest resolution. The hi-hats of the O-Zone Percussion Group sizzle in an authentic fashion, the lightning cymbals truly sound metallic. Concerning space, the musical performance comes with a surprising width. Space gets illuminated to its entire depth. Solo voices appear far in the foreground, as they should, and they come clearly separate from the instrumental background. There is no muddiness. We hear the degrees of width and depth with everything distinctly in its place. For listening at your desk, at the usual distance of some 50 to 70 cm, the sound presscure capabilites of the Desktop TL are entirely sufficient, and ten watts of amplifier power for each channel will absolutely serve. So the upper limits of its output abilities are kept at a distance, with a proper safety margin. We experienced no situation where the speaker appeared dynamically overloaded." The high-end kit comes with high-value MKP foil capacitors instead of electrolytic capacitors. The inductances are baked varnished coils for minimizing microphonic effects. - The current flow through the coil creates a magnetic field which sets the reel of wire in motion. This motion induces a voltage in the coil which adds itself to the signal. The stiffer the reel of wire is, the less the signal will be altered. - In the high-end kit, top quality damping materials are used. The circuit board comes with additional binding posts that have short screw threads.